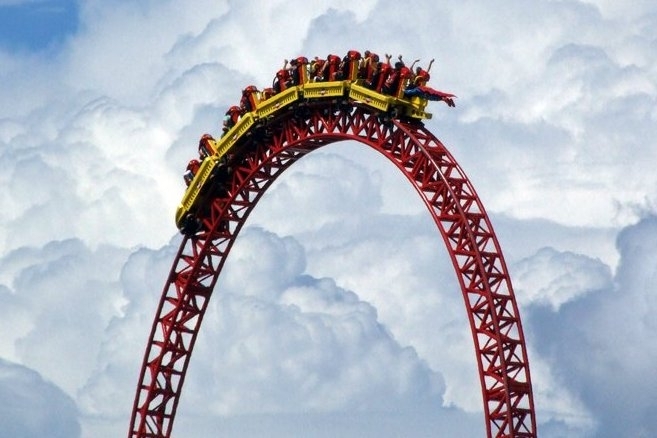 Up and then down - the investment roller-coaster continues to both thrill and terrify participants. We are unfortunately living in 'interesting times' (to paraphrase the supposed 'Chinese curse' - which doesn't appear to actually exist). Investing is a stressful activity because it brings into play our ancient Monkey Brain instincts to run (or fight) at the first sign of trouble. So, what should we do now? Well, to paraphrase Jane Fonda - if it's not hurting, it's not working. Dealing with your Monkey Brain is difficult - but it has to be, or everyone would be able do it (and would be better investors). As I have written in the past, my strategy is to do it mainly by playing tricks on my Monkey Brain. Trick 1: "It's the income stupid!" Trick 2: "Be an ostrich." When the market starts sliding down towards what always seems like Armageddon, just switch off and do something else. Distract the Monkey Brain with some bananas. And stop looking at the share prices. Trick 3: "Look at the horizon." This trick is supposed to be a cure for seasickness (but not successful, in my experience). But taking a longer term view helps distract the Monkey Brain from the immediate fight or flight situation. Emphasise your long term goals over short term reactions. Years of investing in slightly dodgy high-yield investments has shown me that the current fears are almost always overblown - in the medium to long term share prices usually recover. Trick 4: "Follow the rules!" Monkey Brains can be trained, to a certain extent. Telling them that you will give them a banana eventually helps them deal with the current fear that the banana will be taken away for ever. So having some rules, particularly for selling, helps to deal with the inevitable anxiety over 'what to do now'. Anyway, having said all that, I had some cash to invest and have reverted to my long-term strategy of building up the income-producing ETFs (exchange traded funds). The top yielding ETF in the DIY Income Investor portfolio at the moment (at nearly 5.7%) is SHYU, the iShares $ High Yield Corporate Bond UCITS ETF (denominated in £) - so I have topped up. This choice has 'pros' and 'cons': in its favour, it diversifies geographically and currency-wise; on the negative side, it is fixed-income, which (as I keep on saying) is more like to go down in value than up. However, for me the high yield trumps it, and - like most of the ETFs I buy - it is inherently well-diversified to minimise most specific security risks.